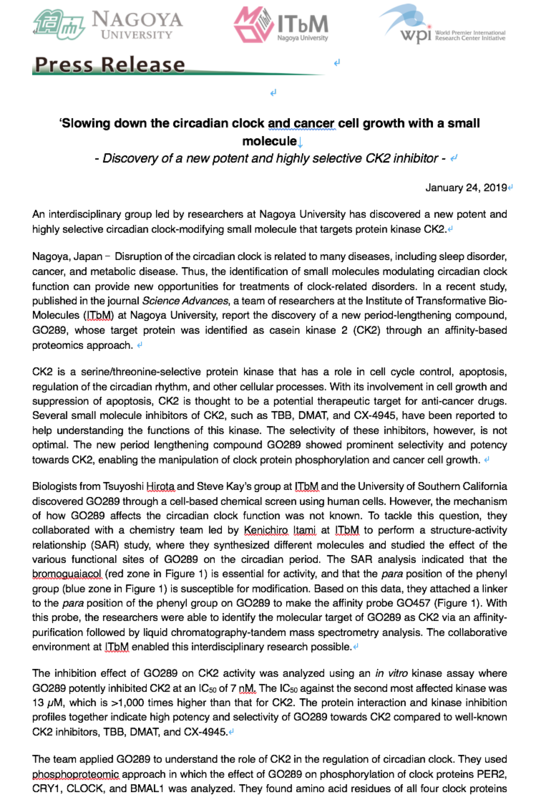 An interdisciplinary group led by researchers at Nagoya University has discovered a new potent and highly selective circadian clock-modifying small molecule that targets protein kinase CK2. Nagoya, Japan - Disruption of the circadian clock is related to many diseases, including sleep disorder, cancer, and metabolic disease. Thus, the identification of small molecules modulating circadian clock function can provide new opportunities for treatments of clock-related disorders. In a recent study, published in the journal Science Advances, a team of researchers at the Institute of Transformative Bio-Molecules (ITbM) at Nagoya University, report the discovery of a new period-lengthening compound, GO289, whose target protein was identified as casein kinase 2 (CK2) through an affinity-based proteomics approach. CK2 is a serine/threonine-selective protein kinase that has a role in cell cycle control, apoptosis, regulation of the circadian rhythm, and other cellular processes. With its involvement in cell growth and suppression of apoptosis, CK2 is thought to be a potential therapeutic target for anti-cancer drugs. Several small molecule inhibitors of CK2, such as TBB, DMAT, and CX-4945, have been reported to help understanding the functions of this kinase. The selectivity of these inhibitors, however, is not optimal. The new period lengthening compound GO289 showed prominent selectivity and potency towards CK2, enabling the manipulation of clock protein phosphorylation and cancer cell growth. Biologists from Tsuyoshi Hirota and Steve Kay's group at ITbM and the University of Southern California discovered GO289 through a cell-based chemical screen using human cells. However, the mechanism of how GO289 affects the circadian clock function was not known. To tackle this question, they collaborated with a chemistry team led by Kenichiro Itami at ITbM to perform a structure-activity relationship (SAR) study, where they synthesized different molecules and studied the effect of the various functional sites of GO289 on the circadian period. The SAR analysis indicated that the bromoguaiacol (red zone in Figure 1) is essential for activity, and that the paraposition of the phenyl group (blue zone in Figure 1) is susceptible for modification. Based on this data, they attached a linker to theparaposition of the phenyl group on GO289 to make the affinity probe GO457 (Figure 1). With this probe, the researchers were able to identify the molecular target of GO289 as CK2 via an affinity-purification followed by liquid chromatography-tandem mass spectrometry analysis. The collaborative environment at ITbM enabled this interdisciplinary research possible. Fig 1. Chemical structure of GO289 and GO457 (top) and effect of GO289 on the period of circadian rhythms in human cells (bottom). The inhibition effect of GO289 on CK2 activity was analyzed using an in vitro kinase assay where GO289 potently inhibited CK2 at an IC50of 7 nM. The IC50against the second most affected kinase was 13 µM, which is >1,000 times higher than that for CK2. The protein interaction and kinase inhibition profiles together indicate high potency and selectivity of GO289 towards CK2 compared to well-known CK2 inhibitors, TBB, DMAT, and CX-4945. The team applied GO289 to understand the role of CK2 in the regulation of circadian clock. They used phosphoproteomic approach in which the effect of GO289 on phosphorylation of clock proteins PER2, CRY1, CLOCK, and BMAL1 was analyzed. They found amino acid residues of all four clock proteins affected by GO289, suggesting broad impact of CK2 on clock protein phosphorylation. With GO289 as a tool, the team believes that extensive investigation of CK2-dependent phosphorylation of clock proteins and how they regulate the circadian period is possible. As elevated CK2 levels are associated with tumorigenesis in various types of cancer, the researchers analyzed the effect of GO289 on growth of human renal cell carcinoma (RCC) cell lines and cells from a mouse model of acute myeloid leukemia (AML). Growth inhibitory effect of GO289 was well-correlated with clock function in RCC cell lines, and GO289 potently inhibited AML cell growth with minimal effect on normal cells. From the results, the researchers concluded that GO289 shows anti-cancer effect in a cell-type-dependent manner, directly linking the circadian clock to cancer. 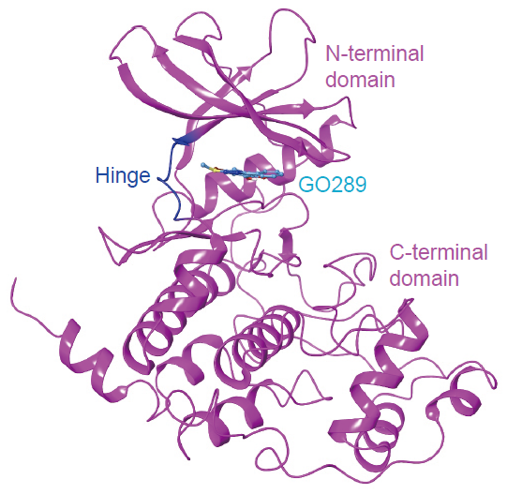 To understand the molecular basis of the potency and selectivity of GO289 for CK2, the researchers determined the X-ray crystal structure of CK2α in complex with GO289 (Figure 2). The X-ray structure proved extensive interactions between GO289 and kinase at CK2α-specific residues without any direct interaction with the hinge region, which is conserved among a variety of kinases. 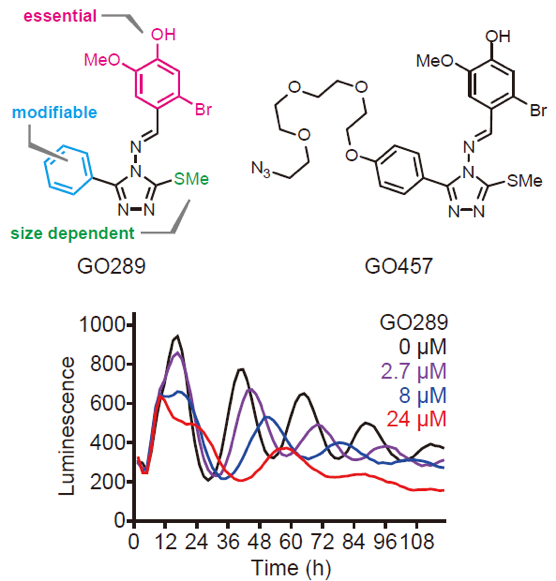 This result revealed unique features of the GO289-CK2α interaction that contribute to the high potency and selectivity of GO289 compared with other CK2 inhibitors. In conclusion, the authors have proven that GO289 presents a new class of highly specific CK2 inhibitors that not only regulates the circadian rhythms but also cancer cell growth. Moreover, the discovery of GO289 may advance the drug design of novel highly selective kinase inhibitors. Future studies will lead to selective and conditional control of CK2 function in vivoas well as shed light on the molecular connection between the circadian clock and cancer. The work was performed in collaboration with the groups of Florence Tama (ITbM), Keiko Kuwata (ITbM), Shunsuke Oishi (ITbM), Takayoshi Kinoshita (Osaka Prefecture University), Yuya Kunisaki (Kyushu University), Kazuhiro Yagita (Kyoto Prefectural University of Medicine), Masaaki Ikeda (Saitama Medical University), Teruya Tamaru (Toho University), and Junichiro Yamaguchi (Waseda University). The work was funded in part by PRESTO Grant JPMJPR14LA from JST AQ49AQ50 (to T.Hi. ); Grant-in-Aid for Research Activity start-up 26891011, Young Scientists (A) 15H05590, and Scientific Research (B) 18H02402 from JSPS (to T.Hi. ); the Naito Foundation (to T.Hi. ); the Inamori Foundation (to T.Hi. ); the Takeda Science Foundation (to T.Hi. ); Grant-in-Aid for JSPS Fellows 16J04435 (to T.O.) and 15J05509 (to Y.N.) from JSPS; Grant-in-Aid for Scientific AQ51 Research (B) 18H02841 from JSPS (to Y.K. ); and Grant-in-Aid for Scientific Research 26119006 and 15K21711 from JSPS (to F.T.). Preliminary experiments and diffraction data collection were carried out at the beamline BL17A of the Photon Factory (proposal no. 2016G665) and at the Osaka University beamline BL44XU of SPring-8 (proposal no. 2015A6518). Fig 2. Figure 2 X-ray crystal structure of CK2α-GO289 complex. The article "Cell-based screen identifies a new potent and highly selective CK2 inhibitor for modulation of circadian rhythms and cancer cell growth" by Tsuyoshi Oshima, Yoshimi Niwa, Keiko Kuwata, Ashutosh Srivastava, Tomoko Hyoda, Yoshiki Tsuchiya, Megumi Kumagai, Masato Tsuyuguchi, Teruya, Tamaru, Akiko Sugiyama, Natsuko Ono, Norijin Zolboot, Yoshiki Aikawa, Shunsuke Oishi, Atsushi Nonami, Fumio Arai, Shinya Hagihara, Junichiro Yamaguchi, Florence Tama, Yuya Kunisaki, Kazuhiro Yagita, Masaaki Ikeda, Takayoshi Kinoshita, Steve A. Kay, Kenichiro Itami and Tsuyoshi Hirota is published online in Science Advances.